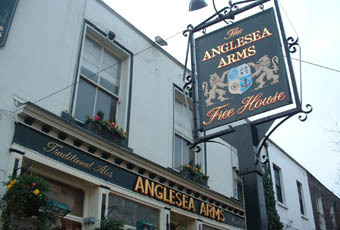 Well its taken me nearly all of 2016 but I finally managed to get to the Anglesea Arms and tick it off! On a busy main road but in a very nice residential area, this is a true locals pub and dining room. 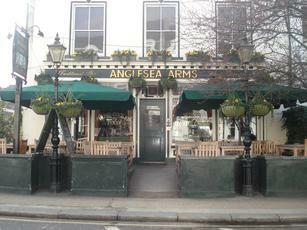 The pub dates from 1825 and us just a stone's throw away from number 11 where Charles Dickens resided. A large open front with benches and umbrellas greets you as you approach, once inside its full wooden and brass. The bar stands directly in front of the main door and had an impressive 6 hand pumps with a good range of local and national branded ales. My pint of Southwark Brewery Routemaster Red @ 3.8% was nicely kept and poured, enjoyed outside the pub where the weather was almost spring like! Food is popular with a separate dining room to the rear down some small steps. The main bar area is fairly small with all tables and stools taken. Appears in the 2016 GBG, on this my only visit I think its a worthy addition. Went here yesterday. Green King IPA (yuck), Truman's Swift and Wandworth's Wandle were available. Sharp's Doom Bar and another were off. I heard one of the barman say to a colleague he was training that "(so and so) can't be bothered to change the barrel on that one" - says it all really. I had a pint of Wandle and it was is pretty good nick, but I won't be rushing back. There's no doubting that there is an interesting portfolio of ales usually on. Interestingly when we were there there was a chap checking the temperature of them all. The one complaint I have is that the staff do seem rushed of there feet and they don't seem to smile alot. Worth a visit or a detour if you are in the locale.